M El Lawindi, M Salem, M Razik, E Balas. Socioeconomic Predictors of Morbidities in a Rural Setting: A Community Based Study. The Internet Journal of Epidemiology. 2019 Volume 15 Number 1. Background: The current study was conducted to identify morbidity pattern and the associations between socioeconomic factors with morbidity within a rural Egyptian community. Design and methods: A cross-sectional study was conducted in Meet Rahina village in Giza governorate. Socioeconomic data about the interviewed individuals, including age, gender, marital status, being employed or not, and if the interviewed woman headed her family was collected. A total of 16 items was used to assess the health status of the individual. Results: The mean age of the included participants (2317) was 36.2+ 13.5 years. Women constituted 45.1% of the sample. About three-quarters of the interviewed participants (74.8%) were married. Two third (63.2%) were educated. Only 5.6% of the interviewed women headed their families. Morbidity was reported by more than three quarters of the interviewed participants (76.5%), and musculoskeletal disorders were the highest reported morbidity (13.9%), followed by Hypertension (12.6%). Multimorbidity was prevalent among about one-fifth of the study participants (19.6%). Age, Female gender, and being married were significant predictors of morbidity among the enrolled participants, while, age and being female were the only significant predictors of multimorbidity. Conclusion: Morbidity was associated with age, female gender, and being a single parent. This information may be vital in designing guidelines and strategies for prevention and care for people for those vulnerable groups. Mounting evidence has identified socioeconomic factors as a crucial factor or trigger in dictating human beings' exposure to various beneficial and harmful health situations (1). One of the most widely reported triggers is the association between lower socioeconomic status (SES) and infirmity, which may be found in almost all countries, however the eminence of disparity may be more evident in some countries than others (2), which is probably due to the vast disproportion in the living circumstances in these countries that are brought about by several factors as socioeconomic and cultural factors (3). Living in a lower middle - income country (LMIC) or having low SES has been proved to raise the possibility of having chronic diseases like lung and gastric cancer, type 2 diabetes, and cardiovascular disease (4, 5). Individuals with low wealth or education levels turned out to have a higher prevalence of asthma, angina pectoris and arthritis in comparison to those with high wealth or education levels (6). Most of the earlier studies that were directed to study the effect of socioeconomic factors on disease burden only shed the spotlight on physical health effects or single morbidity (7). Moreover, examining the relationship between sociodemographic factors and health is gravely understudied in rural communities, which probably may not conform or match the generally perceived socioeconomic-health patterns (8). Especially that access to the underlying determinants of socioeconomic pattern-health gradients, e.g., material and psychosocial resources, are considered to markedly differ between rural and urban areas (9). Additionally, the impact of socioeconomic factors on disease burden remains understudied in Egypt mainly among the rural population. Therefore, the current study was conducted to identify morbidity pattern and to assess the associations between socioeconomic factors with different health problems within a rural Egyptian community. The current study is a community-based cross-sectional study conducted at “Met Rahina” village, Badrashin, Giza governorate, Egypt. The total population who are currently resident in the village is 38540 residents. As for the infrastructure of the village, it has got a clean supply of water to the houses but no sanitary sewage disposal. The village was divided into geographical clusters. The household units within each cluster were identified and included in a sequential approach. A total of 800 household unit was included A purposive sampling technique was used to recruit participants 18 years of age and older who are village residents and accepted to participate in the study. The researchers interviewed a total of 2317 adults during the study period starting October 2016 through June 2017. A pre-tested - structured interview questionnaire form was used to collect data from the study participants. The questionnaire was developed and validated by a previous study conducted in Egypt (8). Section I: Socio-demographic data about the interviewed individual including age, gender, marital status, being employed or not, education, and if the interviewed woman headed her family (single parent household or not). - The participant is considered currently having morbidity problems if s/he reported that s /he was previously exposed to clinical examination at any health service outlet and was diagnosed to have any of the following diseases: hypertension, diabetes, gastrointestinal tract (GIT) diseases: having frequent attacks of GIT problems as diarrhea, gastric pain, Eye diseases: cataract, glaucoma, retinal detachment, corneal opacities, psychological issues: attendance to psychiatrists for any psychological problem, musculoskeletal disorders: back pain, neck pain, osteoporosis, arthritis and rheumatoid arthritis, chronic skin diseases: psoriasis, systemic lupus erythromatosis, blood diseases: different types of anemia, heart diseases: rheumatic heart and ischemic heart diseases, diseases of the respiratory system: chronic bronchitis, bronchial asthma, tuberculosis (TB), Liver diseases: hepatitis, liver cirrhosis, hepatic failure , Renal diseases: chronic kidney diseases, renal failure. Central nervous system (CNS) diseases any types of nerve lesions, cerebral embolism with different forms of paralysis, and cancer: any cancer for any organ and includes cancer blood cells. - The person is considered currently having disability problems (mental, physical, hearing and visual) if the interviewed person reported that he/she have one or more of the following disabilities: Congenital or acquired disability. - Previous studies provide support for the validity of self-reports as a measure of prevalent chronic diseases (Okura et al., 2004) (10). To quantify adult health status risks, the individual health status score (IHSS) included two columns. The first column to indicate if the adult has a specific health problem. The second column consists of the weight developed and assigned for each problem by a previously conducted study (8). Multimorbidity is defined as the presence of two or more chronic diseases in the same individual. (11). The data were coded, entered and analyzed using the statistical package SPSS version 21. For categorical data, frequency, and percentage were used for reporting; Chi-square was used for comparison. For continuous data; mean and standard deviation were used for reporting, the t-test was used for comparison. The association between socioeconomic factors and the 16 health problems representing morbidity and disability was done using logistic regression analysis, expressed as a crude odds ratio (OR) and 95% confidence interval (95% CI). P value ≤ 0.05 was considered as statistically significant. Weighted morbidity score was calculated for each subject according to the previously mentioned IHSC (8), the enrolled sample expressed weighted scores ranged from 1 to 28 with median 3 and interquartile range from 2 to 7, so we assumed that those who obtained a weighted morbidity score above the 75th percentile (i.e., higher quarter) of the enrolled sample, have high burden morbidities and compared with those having low burden morbidities. The Ethical Review Committee of the Public Health and Community Medicine department revised and approved the study protocol. All procedures for data collection were treated with confidentiality according to Helsinki declarations of biomedical ethics (12). Informed consent was obtained directly from the study participants before data collection and after explanation of the study objectives and importance. Anonymity was maintained all through the study. The current study included 2317 participants, aged >18 years who are residents in the Meet Rahina Village, Giza Governorate. Egypt. Their mean age was 36.2+ 13.5, with a minimum age of 18 years and a maximum age of 85 years. Women constituted 45.1% of the sample. About three quarters (74.8%) were married. Two third of the interviewed participants (63.2%) were educated. Only 5.6% of the interviewed women reported that they were single -parents. Smokers and addicts were represented among the enrolled participants by 28.6% and 1.4% respectively as illustrated in Table (1). 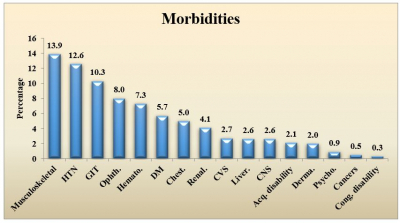 Multimorbidity was prevalent among about one-fifth of the study participants (19.6%) as shown in Figure (1). The highest reported morbidity by the interviewed participants was musculoskeletal disorders (13.9%), followed by Hypertension (12.6%), and GIT diseases (10.3%). The least reported one was the congenital disability (0.3%) as revealed in Figure (2). The distribution of health problems and their number according to individual background characteristics is shown in Table 2. The proportions of individuals having morbidity increased with age (p <0.001). Female gender is significantly associated with disease occurrence (p <0.001). Women who headed their families (single-parents) reported more morbidities (8.5%) (p <0.001). Less morbidity was reported among the educated individuals (56.9%) (p <0.001). Multimorbidity was more prevalent among elderly (p<0.001), married participants (p<0.001), and women headed their families (single-parents) (p=0.001). There is no statistically significant difference regarding the distribution of morbidities or their number with other variables as shown in Table (2). Logistic regression analysis was done to detect significant predictors of morbidity among the enrolled participants. Age, Female gender, and being married were found to be significant predictors of the presence of morbidity among the enrolled participants. 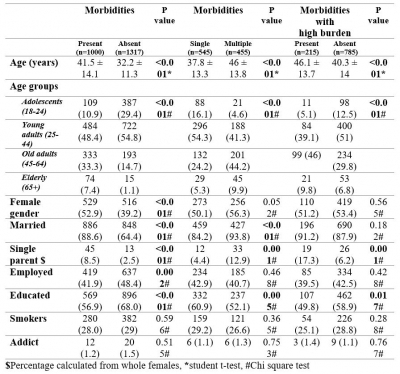 For multiple morbidities, age and being female were the only significant predictors as revealed in Table (3). The only predictor of high burden morbidities was age. (Odds ratio, OR= 1.029, confidence intervals = C.I = 1.017 -1.042). Background characteristics of the enrolled residents at “Meet-Rahina” village, Badrashin, Giza, Egypt, 2017. The current study findings revealed that multimorbidity was prevalent among about one-fifth of the study participants (19.6%) with musculoskeletal disorders being the highest reported morbidity. Age, Female gender, and being married were significant predictors of morbidity among the enrolled participants. 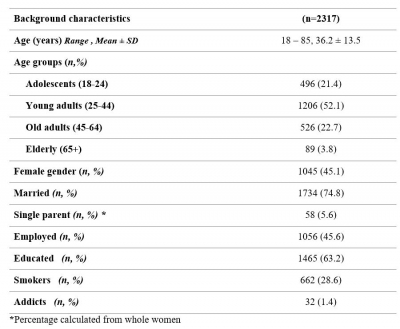 For multiple morbidities, age and being women, were the only significant predictors a strong association between different sociodemographic factors with the prevalence of morbidities. This is in line with previous studies revealing socioeconomic inequalities in morbidity problems (8). There is evidence for the existence of a social gradient in health: where people of low socioeconomic standards have higher rates of morbidities h, complain more about their health, and have an overall lower life expectancy with about seven years (13) , when compared with people with higher socioeconomic standards. Multimorbidity was reported by about one-fifth of the current study participants. Estimates from previous studies vary from 17% to over 90% (14). This wide variation might be explained by different study populations or data sources, usually entailing differences in demographic characteristics and disease types or classification. The revealed figure should be taken into consideration as multimorbidity is associated with a lower quality of life, functional decline, increased disability, and higher mortality (15). A high prevalence of musculoskeletal disorders in the current study was also reported in agreement with other studies (16). 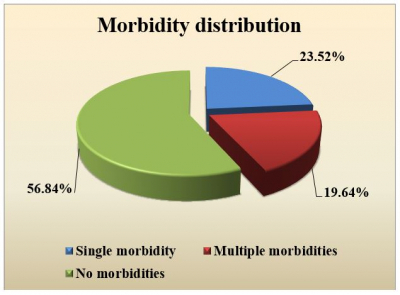 The other prevalent morbidity is Hypertension as indicated by 12.6 % of respondents. This finding is lower than those revealed from previous studies conducted before (17), the difference in the results may be due to different socioeconomic, cultural, and behavioral factors. The relationship between economic statuses (measured in terms of families headed by females/single parents) and the occurrence of both morbidity and multi-morbidity is strong as revealed from the current study findings, where the women who led their families reported more morbidities (8.5%) (p <0.001) and multi-morbidities (12.9% p= <0.001). Women in the current study head about six percent of households and counterpart figure of El-Zanaty and Associates study (2015) study in Egypt was 13.0% at the national level (23). As mentioned by Moragolis and Cross (2008), the problems of families headed by mothers, constitute social issues that contribute directly to most of the health problems of women and children (24). This might explain the current study finding. This alarming finding should be taken into consideration as the problem of households headed by women is increasing in Egypt (8) . The current study findings revealed less prevalence of morbidity and multi-morbidities among educated persons. This is in line with previous studies conducted in European countries that showed that low SES as measured by educational attainment was associated with higher prevalence of multimorbidity (15). The level of education attained by an individual is an essential determinant of workforce status, and therefore income improves an individual’s ability to access healthcare and awareness (14). Cois et al. discovered that higher education predicts the lower prevalence of hypertension in South Africa (7). The relation between age, morbidity, and multi-morbidity was affirmed in the current study. It was suggested that morbidity and multi-morbidity increase with the increased age. This is an alarming finding as the increasing burden of multiple chronic conditions with age implies the reduced quality of life, disability, and vulnerability (25). Another interesting finding of this study revealed that being married was found to be a significant predictor of the presence of morbidity among the enrolled participants. The role of marital status has been established in the literature testing the relationship between marital status and health outcomes (26). The current study finding was in contrast to a previous study finding that revealed that all of the various unmarried states had been associated with elevated morbidity risks. (25) Cultural differences between countries might explain this. This cross-sectional study can be interpreted in the lights of the following limitations: First of all, the cross-sectional nature of the data used implies no conclusion about the temporal or causal relationships between health problems and different socioeconomic factors; longitudinal analysis over a protracted period is needed to be estimated. The current study relied on reporting of the interviewed family member about the presence of disabilities and morbidities that were diagnosed on seeking medical advice only. Thus, silent or undiagnosed morbidities or disabilities would not be included. In conclusion, this study revealed that morbidity was associated with age, female gender, and single-parent household. The information may be vital in designing guidelines and strategies for prevention and care for people for those vulnerable groups. Moreover, the current study findings add to existing knowledge about common chronic diseases by showing their pattern among a rural community. Although our study has some limitations, it has significant merits. First, this is a community-based study on large sample size. Second, the main impact of our findings is that in the future, socioeconomic factors should be taken into account when calculating the health risk. Moreover, a continuous target group-oriented, non-biased public health program is required, prioritizing females and those with low SES. Improving the populations' economic stability and level of educational achievement is likely to be the most efficient and efficacious channel of reducing disease burden. Also, the results of this study may be used to inform and promote healthy public policies that support the prevention and control of prevalent diseases and risk factors in the population. 1. Braveman PA, Egerter SA, Woolf SH et al., When do we know enough to recommend action on the social determinants of health? Am J Prev Med. 2011; 40 (1): 58–66. 2. Hosseinpoor AR, Bergen N, Mendis Set al. Socioeconomic inequality in the prevalence of noncommunicable diseases in low- and middle-income countries: results from the World Health Survey. BMC Public Health. 2012 ;12: 474. 3.Mackenbach J, Stirbu I, Roskam A et al. Socioeconomic Inequalities in Health in 22 European Countries. N Engl J Med. 2008. 4.Sposato LA, Saposnik G. Gross domestic product and health expenditure associated with incidence, 30-day fatality, and age at stroke onset: a systematic review. Stroke. 2012; 43(1):170–7. 5. Uthman OA, Jadidi E, Moradi T. Socioeconomic position and incidence of gastric cancer: a systematic review and meta-analysis. J Epidemiol Community Health 2013;67(10):854–60. 7. Cois A, Ehrlich R. Analysing the socioeconomic determinants of hypertension in South Africa: a structural equation modelling approach. BMC Public Health 2014; 14:414. 8. Yassin S, Saleh DA, Sabry HA, Abdel-Razik MS. Ranking of Socio-demographic Status according to the Impact on Health Status of 5400 Families at Two Districts in Cairo, Egypt. Journal of American Science 2012; 8(3):464-473. 9. Singh, G. K., & Siahpush, M. Widening Rural–Urban Disparities in All-Cause Mortality and Mortality from Major Causes of Death in the USA, 1969–2009. Journal of Urban Health : Bulletin of the New York Academy of Medicine 2014, 91(2), 272–292. 10. Chetty R., Stepner M., Abraham S., Lin S., Scuderi B., Turner N., Bergeron A., Cutler D (2016) The association between income and life expectancy in the United States, 2001–2014. JAMA. ; 315:1750–1766. 11. Dodel R. [Multimorbidity: concept, epidemiology and treatment]. Nervenarzt; 2014 85(4):401–8. 12.Carlson VR, Boyd KM. Webb DJ.The revision of the Declaration of Helsinki: past, present, and future. Br J Clin Pharmacol; 2004, 57(6). 15.Marengoni A, Angleman S, Melis R et al. Aging with multimorbidity: a systematic review of the literature. Ageing Res Rev. 2011;10(4):430–9. 16. Banjare P, Pradhan J Socio-Economic Inequalities in the Prevalence of Multi-Morbidity among the Rural Elderly in Bargarh District of Odisha (India). PLoS ONE 2014, 9(6): e97832. 17. Chinnakali, P., Mohan, B., Upadhyay, R. P., et al., Hypertension in the Elderly: Prevalence and Health Seeking Behavior. North American Journal of Medical Sciences 2012, 4(11), 558–562. 18. Stovner LJ, Andree C. Prevalence of headache in Europe: a review for the Eurolight project. J Headache Pain 2010; 11(4):289±299. 19. Cimmino MA, Ferrone C, Cutolo M . Epidemiology of chronic musculoskeletal pain. Best practice & research. Clinical Rheumatology 2011; 25(2):173-183. 20. Violan C, Foguet-Boreu Q, Flores-Mateo G et al. Prevalence, determinants and patterns of multimorbidity in primary care: a systematic review of observational studies. PLoS One 2014; 9(7):e102149. 21.Poblador-Plou B, van den Akker M, Vos R, et al., Similar multimorbidity patterns in primary care patients from two European regions: results of a factor analysis. PLoS One 2014; 9(6):e100375. 22. Shang L, Liu P, Fan LB, et al. Impact of work and family stress on health functioning in working women. Chin J Behav Med & Brain Sci 2009; 18:151–3. 23.Ministry of Health and Population/Egypt, El-Zanaty and Associates/Egypt, and ICF International. Egypt Health Issues Survey 2015. Cairo, Egypt: Ministry of Health and Population/Egypt and ICF International. 25.Salisbury C. Multimorbidity: redesigning health care for people who use it. Lancet 2012; 380(9836):7–9. 26. Robards, J., Evandrou, M., Falkingham, J., & Vlachantoni, A. Marital status, health and mortality. Maturitas 2012, 73(4), 295–299.